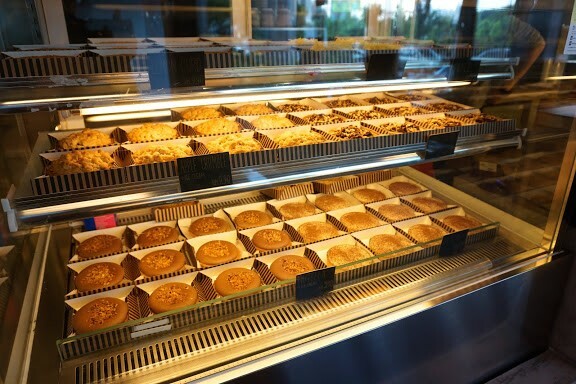 Situated at Damansara Uptown, the shop sits loud and proud facing the LDP highway, which I have often glanced at while passing through the area. 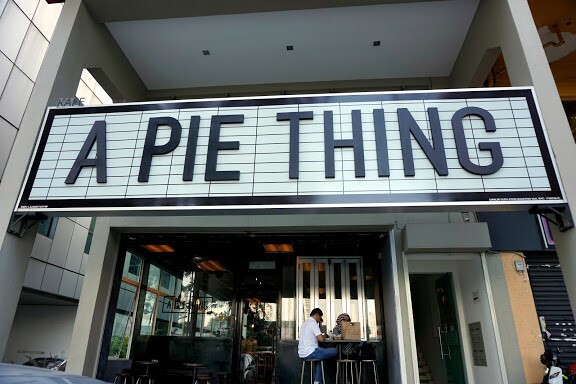 Although pies aren’t exactly my favourite, the minimalistic signboard was what got me curious, so I looked them up and discovered that their creations seem pretty decent. I called up two others and off we went on a Friday evening. Upon arriving, I got a closer look at the layout – along with the signboard, everything else in the shop was a minimalist’s dream come true. Steel chairs, black and brown wooden tables, bare cement walls – this was jackpot to me, because I’m a total sucker for stripped down interior decor. We walked into the cafe and were greeted by Alex and Irene (two of the three founders), following which Alex proceeded to recommend two savoury pies (Chicken Mushroom and Creamy Spinach), and two sweet ones (S’mores and Nutella). The cafe also offers an interesting topping option – The Mashacre! It was all over their Facebook page and Instagram hashtags, so I wasn’t going to let this one slide. I had the Mashacre with the Chicken Mushroom, and plain mashed potatoes and gravy with the Creamy Spinach. We were then asked to take a seat while they prepared the delectables. My partners picked a table and sat down, while I continued to look at their selection. Despite naming themselves A Pie Thing, their sweet pies do resemble tarts, which I’m totally cool with because they really do look inviting. Waiting time was pretty brief, roughly 7 minutes or so, and then we were presented with our two piping hot pies (aww yes) and an ice cool soda that came with the Mashacre package. 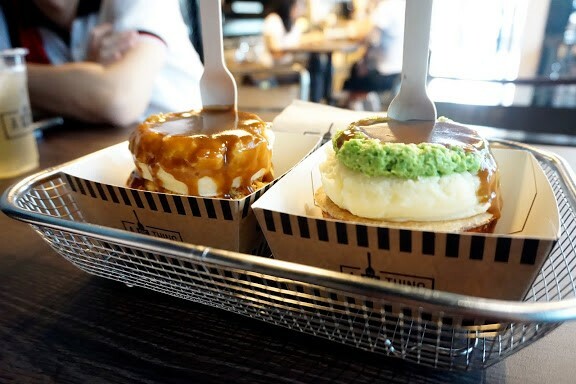 It’s adorable to see these pies sitting so majestically in their paper boxes, with their upright forks – prepared for the massacre (see what I did there?). We sliced the Chicken Mushroom pie straight down the middle and the filling oozed out so smoothly, the taste well-balanced as paired with the Mashacre topping. The chicken was tender and mushrooms well cooked, the sauce’s thickness just right. As for the Creamy Spinach – now, I’m not a vegetarian, but I was happy to see that they do include such an option, and excited to know what it tastes like as I’ve never tasted vegetarian pie. Guess what? I would pick this over something else any day! It was scrumptious, the crust solid enough to hold everything in and crumbling nicely when chewed; the spinach was not overcooked and paired beautifully with the cream. It didn’t feel too overwhelming, surprisingly. The only thing I might have regretted is wishing I could’ve told them sooner to serve the Creamy Spinach pie just the way it was, without the mashed potatoes and gravy. Next came the sweet pies – S’mores (left), Nutella (right). If you want chocolate-y goodness, it cannot get better than this, period. The tiny marshmallows on top of the S’mores were toasted to perfection – slightly crisp on the outside and borderline melted on the inside. That aside, the tart/pie is pretty straightforward; thick milk chocolate scooped in by a layer of crust, because a little goes a long way. On the other hand, the Nutella was one heck of a treasure hunt, and I loved it! I thought it was just going to be good ol’ Nutella spread and the obvious scoop of vanilla ice-cream on top, but it gets better as each bite commences. First, I poked at the heart of the tart, and the top part cracked nicely to reveal that the inner Nutella bits were somewhat fluffed, like muffins. I took a bite and soon found pistachios embedded inside, which I thought was a really nice touch. Double thumbs up. So we’re sitting in a cafe, with the scent of coffee lingering around – therefore it’s only natural that we couldn’t resist. 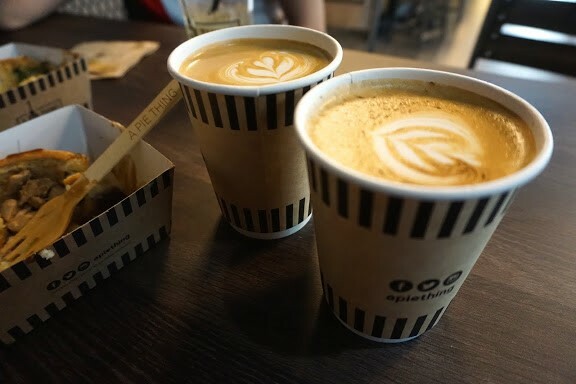 We decided to share a cup of latte and cappuccino just to satisfy our cravings, which were decently brewed. I swapped between both cups and finished up the last few bites of the S’mores, and I am certain that was what satisfaction feels like. 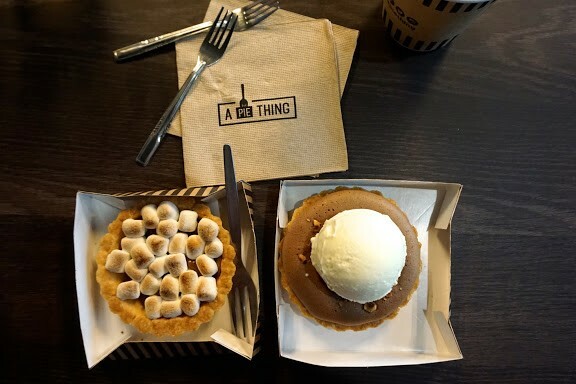 Tags: A Pie Thing, Damansara Uptown, FnB Malaysia, Food and Beverage, Food review, Pie, Taylor's Alumni, Taylor's University, Taylor's University Lakeside Campus. Bookmark the permalink.